4 x USB, FW, DVI, HDMI, etc. Does it work as I expected it would? It certainly seems so! It has the full performance of the Intel Core i7 975 Extreme and the benefit of 12GB of RAM should be evident. In addition to several bootable VHD’s I use on this system it is a real pleasure to have a laptop that is actually able to run VM’s (using VMware Workstation) fluently. Granted it is not nearly as great in performance as my real workstations it certainly works better than any other laptop I’ve ever owned (which at the time I bought them were all high-end mobile workstations from either Sony or HP). The only downside, apart from the size of the laptop is its weight. Yes, 11 lbs, about 5.5kg. But a Kensington Contour Roller laptop bag should take care of transporting it without it becoming a real chore. You certainly get a very solid and sturdy laptop with a Clevo D900F or ones of its various models. A lot of the weight is probably also because of the heatpipe and cooling system used in these (which does indeed perform very well in keeping the i7 975 Extreme cooler than you’d think is possible in a case this small). For some images of this ultimate mobile workstation, check out the large images over at notebookreview.com and xoticpcforums.com. The battery? Oh, yeah, you should not think of it as a battery to run the laptop on for a while, instead you should consider the battery as a UPS (uninterrupted power supply) with an average running time of about an hour. You definitely need the power brick to keep this baby powered. It’s not called a power brick without a reason, though. It’s about the size of a brick and close to its weight as well. 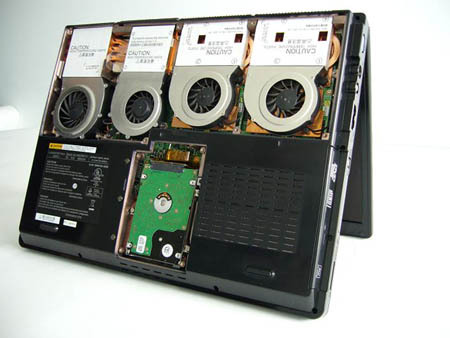 The power supply alone makes any netbook look like a slice of bread. I travel with an extra replacement 7200rpm 500GB SATA harddrive (a Seagate Momentus) just in case one of the 3 inside the system breaks down. They’re disks, they always break and when they do it’s usually the most inconvenient time imaginable. Since I am using the system in RAID0, for performance reasons, I always keep a current image backup of the system on two external 500GB Western Digital Passport drives (those small 2.5″ USB powered ones). Performing a repair and a restore should be a breeze. What I would really like to see and test, and use, is this system with 3 x 512GB SSD’s in RAID0 but with the current price of those it wasn’t worth it to me at this time to get four of those (one as a replacement in case of failure and 3 in the system). But I do suspect the performance would be amazing in this system.